Latest Monthly Assessment - Above-average precipitation during March continued to result in a large decrease in drought coverage and intensity across the Great Basin and central to southern Rockies. According to the U.S. Drought Monitor (valid on March 26, 2019), drought coverage across the continental U.S. is below 5 percent for the first time since May 2017. Below-average precipitation during March resulted in an increase of abnormal dryness and short-term drought across parts of Texas and the Southeast. Long-term drought persists along the Alaska Panhandle, while abnormal dryness has recently expanded throughout the Hawaiian Islands. Drought improvement or removal is forecast for parts of Arizona, Colorado, New Mexico, Oregon, and Utah, based on above average snow water content and recharge associated with snowmelt this spring. 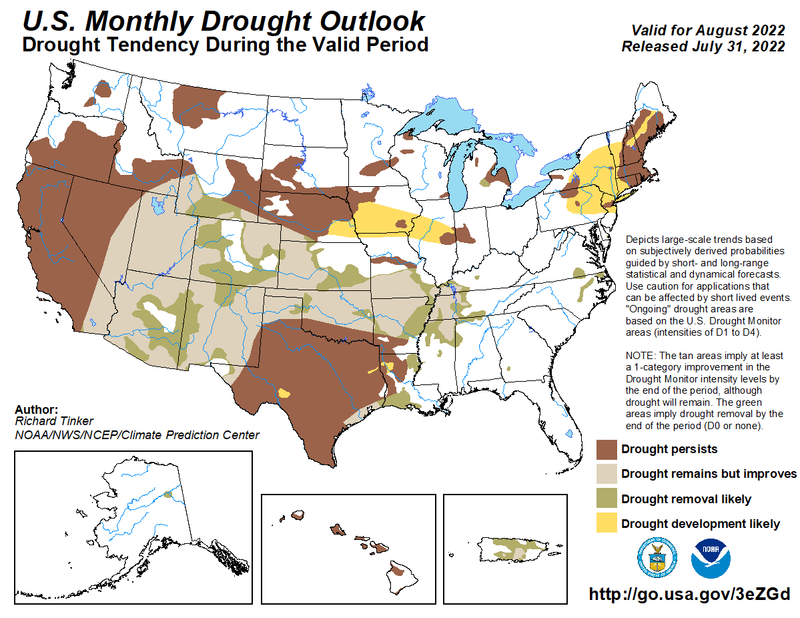 Also, above-average precipitation is likely to continue through April. Persistence is more likely across parts of Oregon and northern Washington where large precipitation deficits were observed dating back to October 1, 2018. Drought improvement or removal forecast for Texas and the Southeast is consistent with the 7-day precipitation forecast along with the Week-2 and monthly precipitation outlooks calling for enhanced odds of above-average precipitation. Due to the wet winter and anomalously high soil moisture, drought development is unlikely across the central and eastern U.S. during April. Long-term drought is likely to persist along the Alaska Panhandle through the end of April. Drought development is forecast for the leeward side of the Hawaiian Islands as suppressed rainfall is likely during the next month. Drought removal is expected across northwest Puerto Rico, but persistence is more likely across central Puerto Rico where larger precipitation deficits exist.